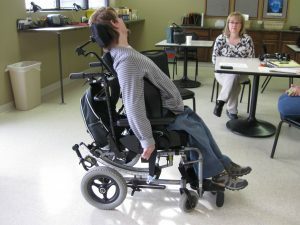 Many clients using wheelchair seating have increased muscle tone. This can lead to active extension, particularly at the hips, knees and neck. When a client extends against a static seating system, the forces exerted against the footplates, seat, back and head support have nowhere to go and this can lead to an actual increase in client extension. As a result, the client may have difficulty tolerating the seating system for a reasonable amount of time (sitting tolerance), and may experience discomfort and even pain. Dynamic seating absorbs and diffuses these extensor forces. Remarkably, this can lead to an actual reduction in extensor tone. Think about it this way. Perhaps you have sat on a mat table or couch with a client who is actively extending. If you try and resist this extension, the client may push harder. If you allow the client to extend, however, and then help them to return to upright, the client relaxes. I have observed a number of clients who spent much of their day “fighting” their static seating system, who were able to sit fairly relaxed in a dynamic system.